I mentioned before that Blue Brown seems to be a shade that people either love or hate. The main problem associated with this pigment or type of color is that when it's sheered out, the brown fades into a soft wine-red, which can make some people look like they just did 10 rounds in the boxing ring. Since the reddish undertone is the main problem for many people, here are 5 ways to get around it. To get the true rich blue-brown shade you see in the jar, you need to be able to pack the pigment on intensely. Unfortunately, powders will tend to spread out and fade with blending and general movement even if you foil it, so to get it to stay looking great, make sure you apply a brown base. MAC Blue Brown applied over MAC Take Root Cream Color Base, with black kohl along the water line and black mascara. Sometimes it's nice to bring out the red tones of the pigment instead of trying to fight it. Try loading your brush with a light silvery shade first, and then dipping it into Blue Brown before applying it to your skin. It will transform into a soft silvery mauve brown with pale teal highlights. An even more interesting color to mix in would be a white pigment with a blue sheen. MAC Blue Brown mixed with MAC Frozen White pigment. Apply a navy liner , and dab a little more Frozen White in the inner corners so it's brightened up. Day 3: As a liquid liner. This is so simple I'm not sure why more people don't do it. Blue Brown is amazing as a liquid liner whether on its own or when paired with either aqua, teal or brown shadows. It blends in with those shades, but flashes a different color with the light. You can use eye drops or a liner mixing medium for longer wear. MAC Blue Brown worn as liner along the upper lash line, with MAC Concrete as a matte, dark cocoa wash.
Day 4: Oomphed-up and Contoured with Gunmetal Liner. This is a more sultry look and plays with lighter and deeper tones circling Blue Brown. I used a silver and a dark matte brown. MAC Blue Brown as main lid color with Vex at the inner corners and Concrete at along the crease. Gunmetal pencil (Bourjois 51 Noir Effet Miroir) applied along the lash lines for definition. Day 5: Colorful Fantasy Glimmer. I armed myself with 2 other items that had the same answering teal/aqua gleam with Blue Brown. A soft aqua-teal shadow and a white duo-chrome glitter with aqua sheen. Apply Blue Brown as you would usually, over a good base, then run an aqua shadow along the lower lash line and finish by dampening a little aqua glitter and dabbing it onto the center of your upper lids. MAC Blue Brown pigment paired with aqua shadow along the lower lash line and MAC Reflects Transparent Teal dabbed onto center of the lid. These are just 5 ways to wear it. There are definitely more. If you like how Blue Brown looks in the jar, then it's simply a question of using the right methods to get it to look its best on your lids, and playing around with different color combinations to give yourself some variety. Why do they all look so similar? 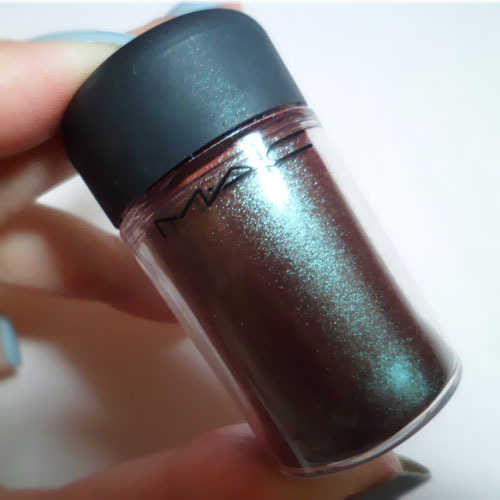 Because the "raw-ingredient" mica that gives the duo-chrome finish came like that; it's not an effect that cosmetic houses achieved by blended a dark brown and an aqua interference shade together. It's important to know because the bad news is that you're going to find it really hard to accurately recreate or dupe this shade by blending brown and aqua shadows on your own. The good news is that it's readily available to most cosmetic houses from their pigment suppliers, so the color is not at all rare. I loved this post and once again am greatly inspired by your post. And the great thing is that it only costs £1! It vaguely reminds me of Label Whore from Too Faced as well!